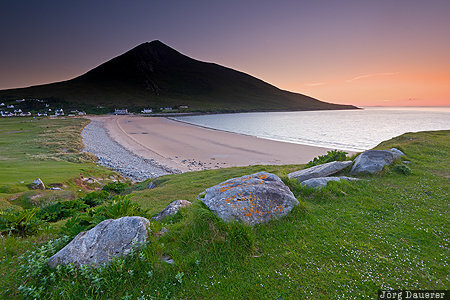 Sunset behind the mountain Slievemore in Achill Island and Doogort Beach in the foreground. Achill Island is in County Mayo in the west of the Republic of Ireland. This photo was taken in the evening in June of 2016. This photo was taken with a digital camera.